Greetings everyone, Shopro have brought this deal back again, an excellent deal for this power bank. I believe this the cheapest price since the previous deal. I believe this is the cheapest local price for this so far and will ship quickly. Xiaomi Mi Power Bank Pro 10,000mAh Type C for $29.95 Delivered. I've personally experienced some great service from Shopro in the past and am happy to keep bringing deals to everyone. cheapest, these guys are Melbourne based. The 20000mah has USB-C PD which is used for laptops, etc. @YellowKnight: Technically yes, but it depends if you have any devices that need/use the PD spec, as mentioned above, commonly laptops, tablets. How does one know if a battery pack can charge their laptop? i.e. i have a hp spectre x360 - older 2018 model but i notice the power block is 65w? if this is only 45 w does that mean you can still charge via the thunderbolt PD port but at a slower pace? As long as a battery pack has PD does that mean it's compatible? Same question I guess as when I was looking at thunderbolt hubs to expand my thunderbolt into USB A and HDMI ports out etc , wasn't sure with power delivery through the hub ("power through" tech or whatever they call it) whether you can gauge if it will be compatible with your laptop? ?any ideas? if this is only 45 w does that mean you can still charge via the thunderbolt PD port but at a slower pace? As long as a battery pack has PD does that mean it's compatible? Yes. You may get a warning that you have a slow charger attached to your laptop, but it will charge. @cwongtech: Can this charge a non type-C laptop? @cwongtech: Hi @cwongtech - thanks for the feedback. It seems the prior hp spectre x360 models were 45w chargers from what I can see online? It seems my late 2017/early 2018 model (not the most current gen that just came out but one above) now uses a 65w charger. Is it still applicable that this could charge despite only offering up to 45w? There seems to be a bit of "google chatter" that hp have locked the PD to be proprietary to work largely with their own internal products as opposed to other manufacturers who allow 3rd party hardware? There seems to be a bit of "google chatter" that hp have locked the PD to be proprietary to work largely with their own internal products as opposed to other manufacturers who allow 3rd party hardware? I've never owned a HP laptop before..
Can you message me the detail, we will check. I have signed in via Google but when I try to add to cart, it takes me back to log in the screen. Still working on it,may i know how you solve this. @vandite: I tried to sign in then went to 404 error so went back to main page. Somehow, I got welcome email. I tried to log in from mainpage then it logged in. All good now,, please try again. Hmm they sell quite a lot xiaomi products but not mobile phone. Any clue doweyy? I'm in Melbourne. How long does it take to ship? It will not. It charges the same way as if it were plugged into the wall. This will be my 5th Xiaomi power bank. Never had ANY issues. I'm only buying a new one because I'm going backpacking for 2 months and I want to know the cells are new, not that I have noticed any degradation on any of the other xiaomis. Other brands all failed me quickly. How does this compare to the Samsung power bank they were giving away? Wouldn’t call them terrible - you’re bound to lose a few Wh from efficiency loss (stepping up the voltage from the 3.7V at the cell to 9/12V). My Xiaomi bank gets quite warm when fast-charging at the higher voltage. *The “actual” capacity of this Xiaomi is quoted as 6500mAh. Yes its even cheaper than Banggood etc.Good for us.We get local stock quick delivery and warranty etc. Is it possible to do local pickup? Going away over easter so keen to buy an extra power bank. 2 is single USB output. 2s is dual USB and a bit taller. Yep it's the 2s, seems like the description on the listing has been changed to just say 2, but it's definitely the upgraded model with dual USB. Physically Power Bank 2s has 2 usb ports and can charge 2 devices at once. 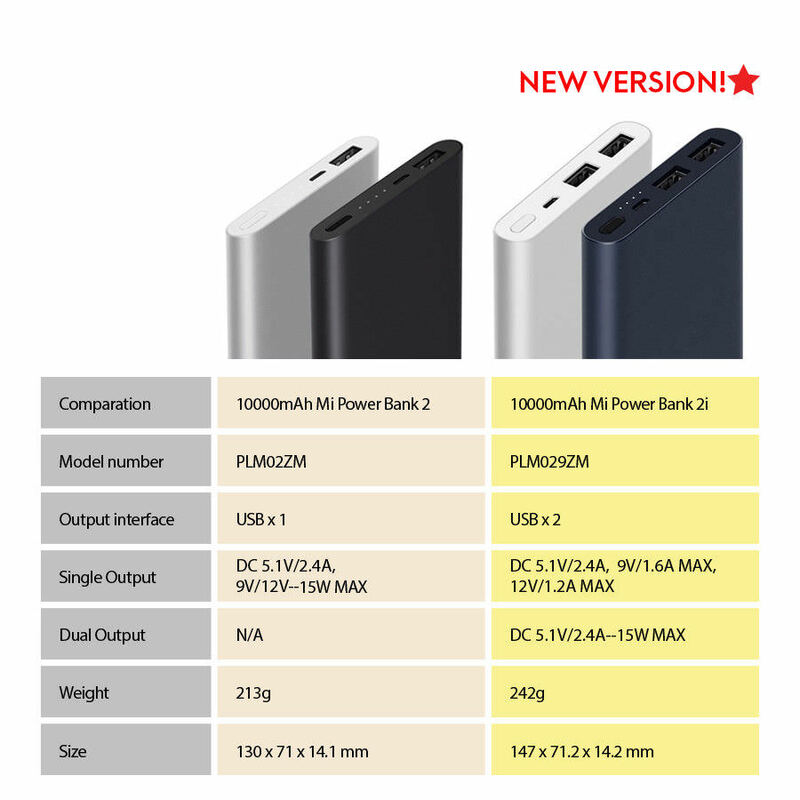 Power Bank 2 comes with only 1 usb port. Shopro have just beaten that price, thanks for pointing it out. I've had the Comsol powerbank and it's faded badly. Doesn't even charge my mobile completely anymore after about 30 recharges total. Anyone had this for a while and know if it keeps its capacity? I have the older regular 20,000 Xiaomi (2 of them in fact) and love them. The first one was used daily during my travelling for 6 months, each of them are still used a few times a week. The original one seems to have faded slightly but is still going very strong. Perhaps lost 10-15% of its life at a guess? Yeah I am trying to log in with Google to purchase and it won't let me log in, just keeps looping back to a 404 page… sigh I really wanted a Power Bank 3 Pro too… oh well. Still working on it, looks like some customers have this problem now. Will fix ASAP. yep same. want to buy but can't login with facebook, google or my shopro account. disappointing. All good now, please try again. I just bought the inductive model for $30 in china lasts week. Lasts a week?! Great tech over there. Unbelievable. So much cheaper than buying it here. @unifex: Wow that’s actually really cool. Nice work! Hi, do you know if there any deals soon on the 20,000mah 2C? Are there any 10,000mah power banks worth buying with USB Type C charging? 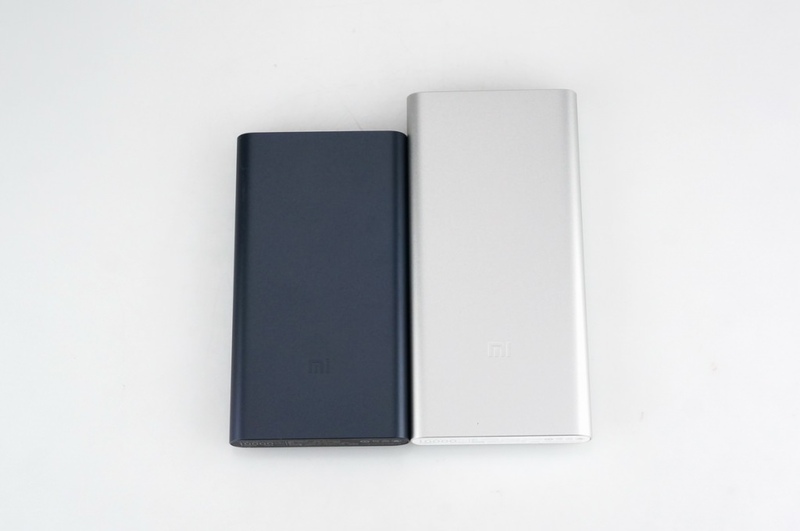 The original Xiaomi Powerbank Pro 10000 mAh. It is a very old model by now though. I have this.Type c is only for input though.Also its twice as expensive. I bought the TQKA 10,000mah USB C power bank off ebay for $16 shipped recently. Works well (USB C is only for input but at least it means i only need to carry one cable with me to charge it and get output out of it). Looks like New Model is out. And even a qi enabled powerbank. Hopefully the 2019 one will go on sale soon. Will definitely pick one up, if not I will go for the TQKA. This is cheap. Even cheaper than offical Xiaomi stores in China where they were about $11 each. Sorry I'm just an idiot and misread the post AND remembered incorrectly. Went through my photos from China back in March (took a lot of photos of items to see if my brother and dad wanted anything from the store - I ended lugging heaps of Xiaomi products back) and they were 79 Yuan which is about $16 at todays exchange rate. Will it work with Macbook pro 15” 2016? TIA. I need one very urgent. How many days to get it delivered to Sydney? The eBay one takes one week. They come in super handy for those times your phone is low/flat and you want to keep using it away from power point, long journey on bus or plane, camping trip, even a power outage. Haha, sounds like a riveting true story,….exciting, believable, sad ending lol. I'm sure your not the first, and won't be the last. Does anyone know where the payment processor is for Shoppro? Looking to avoid the 3% credit card fee if they are based outside of Australia. Any reason you don't want to use Paypal ? with code PEACE comes to 67.99 on ebay. 20c more than this deal. Dual output on 6000mAh is an odd feature. On 20,000 and maybe 10,000 sure but… Oh well it's decent value for a brick n mortar store I guess. The aldi one is listed as 6000mAh but perhaps that is at 5V? The Aldi unit looks much cheaper - and almost same capacity. Thanks OP. Bought one last time for ~$21 so will gladly get another for $18. Not much heavier than the smaller 5k varieties either. Thanx OP, have got sliver one for the Mrs, now a black one for me. Excellent very fast charger. Bought about 7 in the last year, cheap present and useful. I would love to see a smaller capacity (less weight) high output PD USB-C battery pack. Something like 10,000mAH. Would love to be able to give me phone and MacBook Pro a top up charge through the day when travelling. This one at 20,000mAH is ~400grams which I think is too heavy for short one day business day trips.